Last night we took 98-year-old R out to dinner. They say evenings are a lonely time for people living alone and that’s no doubt true for many. Perhaps because R has been widowed so long, being alone at night is normal and relaxing–a time when she can eat dinner while enjoying her favorite TV programs. Nevertheless, she loves going out for a meal–usually takes half of it home because, it seems, older people eat less. I touched on this recently when I wrote about our Feb. 28th lunch. Also–if you missed it–do read “What a 97-year-old Eats”, my March 5, 2011 post when R was 97. There’s good information that I won’t repeat here. Last night, after dinner, R needed some groceries. She requested going to Trader Joe’s. With her shopping list in hand, we were efficient. Here’s how she works/thinks everything out. First, she makes everything as easy as possible when it comes to meals. Groceries are heavy, so she gives thought to the size/quantity she buys–always checking dates. If she’s with someone who can carry a heavy gallon of milk with a late future date, she’ll buy it. Otherwise, she buys a carton that weighs less. This is a heads up when we shop for/with parents…….get the heavy stuff if it won’t spoil. “I’ll add these little tomatoes,” she says, picking up the plastic box, “and I’m getting a can of the sliced black olives–they’re cheaper than the whole olives and it saves me cutting them up–sometimes I add these to the salad–gives extra flavor and they’re healthy.” R. explains that she puts all her salad fixings, with dressing, in a container with lid (like the one her take-home food from the restaurant is in), and shakes. No mess. Salad ready. R steams a few vegetables–asparagus and artichokes–when the price is right and the price was right for the artichokes. “I have a strainer thing you put them in–in the pot, cover, and steam. It’s simple.” And then R adds: “Some of the prices are terrible so I can always eat frozen or canned vegetables or canned fruit. Every day I eat a banana ’cause it’s a fruit–and usually have orange juice I’ve diluted with some water to make it milder.” That’s 2 easy fruits. R’s meals usually consist of one item that simply needs heating–in the oven or on the stove. The rest of the meal preparation is even easier or needs no preparation. It’s quick, there’s plenty of nutritious food, and little mess. Snacks, dinner, and dessert follow on Saturday. 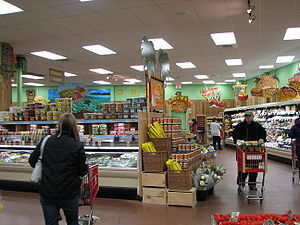 This entry was posted in Aging parents, Food and tagged easily prepared food, healthy 8 chopped veggie mix, helping buy food, no mess preparation, quickly prepared food, senior preparing food for self, Trader Joe's. Bookmark the permalink. I recall noticing that my own grandmother ate 4-5 small meals daily. I don’t know if it’s mainstream or not, but food preparation in 87+ year olds is low on the priority list. Even if they’ve enjoyed cooking for years, as they age – they enjoy it less (and of course, they’re usually only cooking for 1). You’re so right, Lisa. If this is helpful, R has worked it out so her entire meal preparation never takes more than 15 minutes (if she’s warming something in the oven…she has no microwave). During that time, she shakes the salad w/dressing, may drink soup warmed quickly on the stove and poured into a cup (no spoon to wash), sets the table, gets dessert and pours her drink. She puts everything except dessert on one plate–less dishes to hand wash.